In the annals of books about Bob Dylan — and there exist libraries of these volumes — there is no book like this one. It is second only to Dylan’s own Chronicles in being the most poetic book on the subject, and stands alone at being the most romantic. 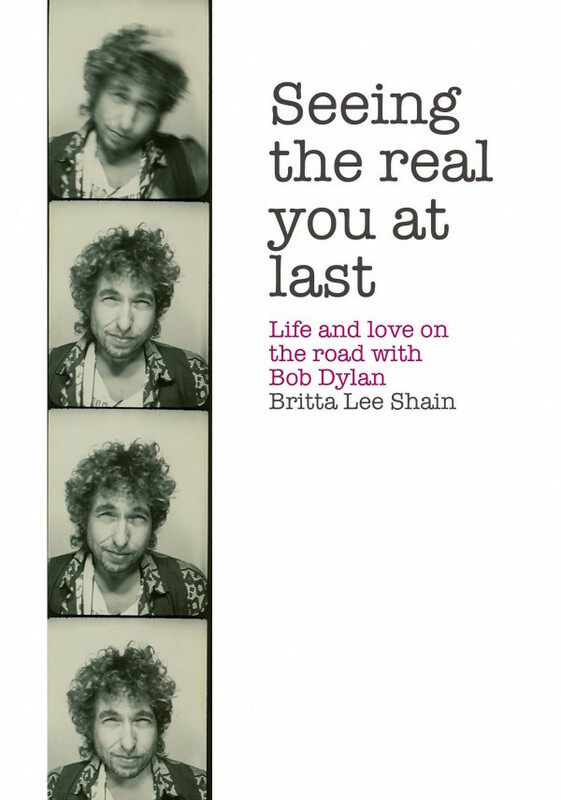 Britta Lee Shain, a songwriter herself, had a slow, sweetly simmering romance with Dylan that gradually blossomed, and soon spanned around the world as she went on tour with him – from Dylan’s sprawling Malibu homes to Israel and beyond. She was as close to Bob as anyone has ever been, and offers here a perspective on a time in his life – the mid-80s — that has rarely been viewed, and never captured as intimately or poetically as it is here. Except the intimate interiors of Suze Rotolo’s book, A Freewheelin’ Time, which captures the first New York chapters of Dylan’s career, there is no book on Dylan that brings this perspective on the man – and also on this mid-80s chapter. And were she not such a fine writer, this would still be engrossing stuff. Because Dylan remains both one of the world’s most formidable and influential artists as well as an ongoing mystery, any glimpse behind any part of his mask is compelling. Were we to find a journal scribed by one of Shakespeare’s lovers, showing us the man behind the miracle art, it would be the same. Any glimpse into that mystery – into the reality of the man from whom all this world-changing art has flowed – is remarkable. But this is so much more. This is Dylan the romantic, and told in beautifully inspired prose that elevates the proceedings to exalted heights. Britta’s a gifted and inspired writer who summons up the past with fluid grace and clarity, and with a songwriter’s heart and eye for keen detail. Even odd and funny accounts about the man contribute to the myth, and can be read symbolically, like his lyrics. For example, her account of being mildly appalled when she developed a roll of film he shot, only to discover every photo was out of focus. It resounds on many levels at once: After all, with rare exceptions (Nashville Skyline), Dylan has rarely chosen an in-focus photo of himself on an album cover. The iconic photo on Blonde On Blonde is famously “soft-focus,” which is a nice way of saying blurry. But maybe this is the way he sees the world! Maybe why, back in Woodstock days, he wore glasses, but rarely has been seen in them since. Perhaps modern times to Bob Dylan is a perpetual blur. Maybe not. But like in a Dylan song, not unlike those cubist paintings he loved, many realities and perspective possibilities exist at the same time. And so these heady details ring like a bell, with both music and power. This is, as mentioned, a view of the artist not from the outside looking in, but from the very interior itself, and gives us an idea of Dylan the man, Dylan in the world. He’s funny, romantic, petulant, hot-tempered, silly, indulgent, desultory and always unpredictable. Unlike prevalent distanced views of the public Dylan we’ve received so many times, this is a loving reflection of the private Dylan, who is — despite decades of myth — a human. Like other humans, he’s a man of great appetites (pastrami sandwiches and fries play a significant role); his carnal proclivities with assorted back-up singers on his tour led him to view Britta – at first anyway – as a romantic ideal, a love song of sweetness and purity. His flights of romantic fancy inspired him, for example, to stop his tour bus in the middle of the Italian woods, grab a bottle of wine and a guitar, and lead Britta into the woods. There she’s serenaded by the Tambourine Man himself. For that passage alone this would be worth the price of admission. But there’s so much more. There’s also insight into his affairs of the heart, which reveal a lot about Dylan the man. He was a guy, and remains so, who became the object of obsession of millions. That is a whole lot of mind-trips for him to deal with, and he found many strategies for doing so. But, as Britta reveals, he was not above those himself. For example, he forbade his wife Sara from wearing glasses at his shows, he said, because he didn’t want her to be able to see all the other women around him. Also revelatory is the way Dylan wraps his entire world around him. Whether he’s home in Malibu, at his Minnesota farm, or in a hotel room in Tel Aviv, it’s Dylan’s world, and everybody else spins in it. Always he’s surrounded by the books he loves – and some odd and unexpected reading choices – movies, music, love. Cool clothes and hats and boots found in second-hand stores. This is how Dylan has maintained the “endless tour” over these long and many years. He brings his entire world with him. Indeed. A warrior wearied and bloodied by battle. But a survivor. One who emerged intact, and with a remarkable and beautiful book that contains all of it, even the parts almost impossible to contain. Or the great moment when a crazed fan somehow breaks through all the barricades to get right up to Bob in his limo, blurts out his undying love, and hands Bob his CD. Bob accepts it, drives off, instructs the driver to open the sky roof, and immediately hurls the CD out the roof, ejecting it forever. But mostly Dylan is funny, curious, open to all information that comes in, and exceedingly romantic. He’s also a friend to his friends, and is justifiably concerned with loving a woman who belongs to a friend. He isn’t forever sailing in the “waters of oblivion” he wrote about (in “Too Much Of Nothing.”) He is in the world, and aware of his impact in it, both positive and not. That he views the world in cosmic colors should come as no surprise to those of us who have loved and learned his songs over these decades. But told in Britta’s infused prose, and informed so intimately by her great recall of all the details, this is a rich treasure trove of Dylan as Dylan, and will remain cherished as such forever. Some critics – and in these modern times, sadly, anyone can now be a critic – doubted the veracity of the words and actions captured here. Suggesting she could not remember this so clearly all these years later. Really? Imagine you were close to Bob Dylan, and traveled the world with him. Would you not remember every word, every instance? Would you not jot down his jokes and spoken poems? Would you not cling to these memories as fragile beloved baggage for the rest of your life? Not remember? How could you forget? Fortunately for all of us, and for the Dylan history — which is forever being shaped and rewritten — Britta did remember. And with so much love, and yet honesty. She does not paint things in rosy colors. When he does a performance that isn’t good, she doesn’t lie about it. Which lends the entire thing its authenticity. As romantic as it is, it’s also told with some detachment – as someone who was inside and then cast ultimately out – so it’s no hagiography. Dylan is no angel or saint. Though he sometimes aspired to be. And like the legacy of Shakespeare, which has led many to even doubt his authorship of his own work, the same is applied even now to Dylan, during his lifetime. The prevailing doubt that no one man could have written all this work. “People have a hard time with anything that overwhelms them,” he said about this very subject. Which does bring it home again. That this is an overwhelming subject, this one man who has had such an impact not just on the evolution of popular song and singing, but on the spirit of the planet itself. Long after he is gone, people might doubt he was a real man. And that’s when this book will become even more cherished, as it shows us not only the genius – not only the mythic tambourine man himself – but the man. Britta not only wrote a book on the man, she wrote a song with him. Something I have known about for several years, and always encouraged her to sing in shows. After all, if I wrote a song with Dylan, I would play it every show. So it is received with real joy the fact that she included the story of writing their song, and even its lyrics, in this book, along with other beautiful photos and Dylan memorabilia she collected. It’s called “You Can Blow My Mind (If You Want To).” It is a testament to the inspired river always flowing, and her time not only sharing Dylan’s canoe, but helping to steer.